A few weeks ago, I took my friend out for his birthday. I’d organised to head to a free ‘Symphony Under the Stars’ concert. Before you accuse me of taking him out on a cheap date for his birthday, here’s the deal – I did the planning and brought along a sensational picnic dinner (OK, this was mostly “sourced” rather than cooked). Sometime into interval, after the scrumptious dinner, I surprised him with the cutest double decker mini chocolate cake ever (this was homemade!). He was pretty chuffed, but then, knowing me as he does, his expression changed to fear, and he asked, “You’re not going to sing Happy Birthday loudly and embarrass me are you?”. I responded by singing Happy Birthday very loudly and encouraging those around us to join in, which they happily did. At just that instant, the orchestra had commenced their post interval warm up. I began to notice that their cacophony of warm up noise was morphing into some much nicer sounds… and so it was that the entire audience, accompanied by the 70 piece symphony orchestra sang Happy Birthday to my friend. You guys know by now that this is going to be a story about Agile – right? In my team, we are making a bit of noise. When we’ve completed a story, the person who does the finishing, gets to have a turn on our very own toy xylophone to announce, in the most pleasant of ways, that another story is in the “done” column. Halfway through last sprint, I noticed that we were well on the way to completing everything we’d committed to in the sprint. I felt that this called for a soundful acknowledgement, so during our standup the finale of the 1812 overture filtered through the office, complete with cannons. Was this disruptive? Well quite possibly, but all for the right reasons. It probably made people wonder what wonderful thing had happened. It probably also made some people want to get with the team that’s having the most fun! It was however, pretty apparent to me after the 1812 overture incident, followed by Parrell Williams’ Happy and Alex Lloyd’s Amazing, (when we did complete all the stories in the sprint), that the team was finding my musical taste a bit eclectic (read “only suitable for those over 40”). I countered with a competition to supply some music we can use when we are happy, excited, kick some goals, or finish a nasty story. Hinting at a past spent in too many 80s dance clubs, one team member came back to me with the sounds of an all-night party mix of Sing hallelujah, Such a good feeling and Ride on time! 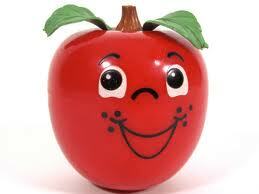 Our other sound is that of our cheery faced 1970s retro toy – Happy Apple. When you tap him, he emits a very soothing chimey sound. Having brought joy to a couple of generations of kids in my family, his goofy face is now bringing cheer to generation digital. Happy Apple has been making some noise as he makes his way around the team as a way of acknowledging when someone shows great agile-ness. And so back to symphony orchestras. There’s probably no need to panic that they’ll be playing in my workplace any time soon. What is happening though, is that the sound of Agile, like that of Happy Birthday, is getting us to celebrate, collaborate and get the job done. This entry was posted in Agile, Scrum and tagged Agile, Chaos, Disruption, Happy Apple, Music, Scrum on June 14, 2014 by Katrina Kolt.